The site, located at the junction of Station Road and Gorsey Road Coleshill comprised a roughly square plot of ground largely covered by vegetation and occasional concrete hardstanding. A fuel tanker depot forms the western boundary with industrial units forming the north, east and southern boundaries respectively. Historically, the site had seen use as a corn mill prior to the Second World War, subsequent developments on the site included engineering works, concrete works, gas works, planing & saw mill and timber yard. By 2011, all of the factory buildings had been demolished. 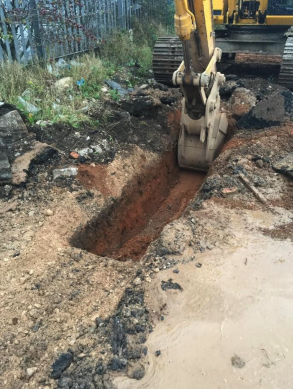 GIP Limited (Environmental consultants) carried out Site Investigation works during January 2015 and identified made ground overlying Mercia Mudstone and river terrace deposits. Groundwater was confirmed at approximately 1.5 m below ground level. The contamination issues were identified as elevated concentrations of Polycyclic Aromatic Hydrocarbons (PAHs) and Total Petroleum Hydrocarbons (TPH) confirmed in both the groundwater and two soil hot spots located in the south eastern corner of the site. It was believed that this contamination resulted from the historical industrial activities on the site. A small River / Stream lies approximately 250 m from the site and was considered to be the prime receptor for any potentially migrating groundwater contamination. Envirotreat was engaged by Tame Construction to agree an appropriate Remediation Strategy and Methodology with the Local Council to enable the discharge of the relevant planning conditions for the proposed development of new industrial units. The strategy comprised an integrated remediation approach that included the installation of an E-Clay groundwater treatment barrier with the prime objective of protecting the River / Stream along with in situ E-Clay stabilsiation / solidification of the identified soil hot spots. This approach ensured the protection of both human health and groundwater receptors.